I spotted a post on Facebook and was going to check my files when I realised that I should do a blog with the details for others to research their nurses or midwives. And while we’re at it, someone might know the identity of the nurse in the photo. 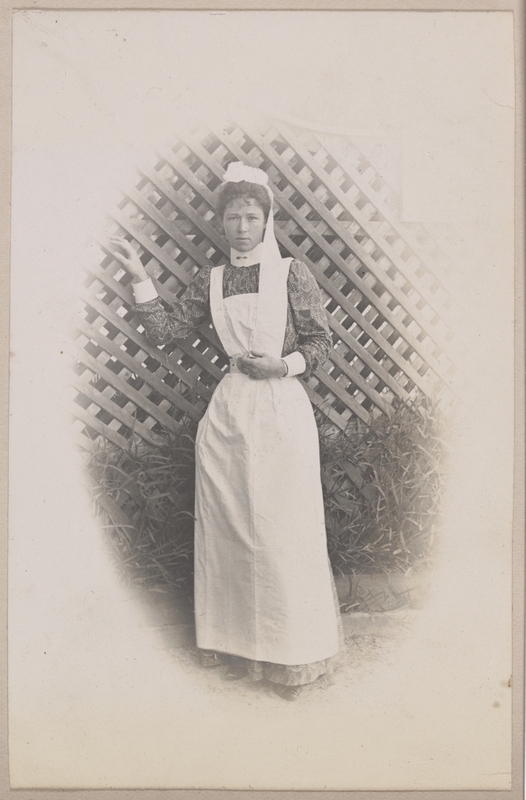 The image is from the State Library of Victoria collection [H2006.188/34] and it states she is a young woman, identified only as “B.P. from – a nurse from Frankston, Victoria”. The photo was taken in 1900. The files I mentioned? Some years ago I spent many hours searching for and finding these files – hence I recorded them in a couple of spreadsheets. Most of the lists are alphabetical BUT DON’T STOP at “Z” because you may be reading the initial list of those added to the register, then there may be a list of those removed from the register, then those who changed their names [i.e. by getting married], and others who changed their address. All wonderful information for family historians and researchers. Now and again the Gazette will include the entire list of everyone registered and year of registration. Some lists include their date of registration. I haven’t had the need to search but I presume that all states would have had this type of register in their Government Gazettes. And of course Nurses and Midwives weren’t the only lists: Railway employees being one occupation that comes to mind. If they had to be “registered” or were Government employees, then LOOK FOR THEM! There are Dentists, Doctors … the list goes on and on. So back to my lists – the reason I looked for them and then downloaded them was to select [with help from some of my wonderful volunteers] any nurses or midwives and therefore add them to my Geelong & District Database. Women aren’t easy to trace and midwives in particular were some of the women who didn’t have to give up their job when they married. You also learn what files may contain by being observant – e.g. I included page numbers / ranges – this might give you the clue as to whether it was a yearly register or a complete register. Have a look at the Nurses board for 31 December 1935 – page range is 2051-2135 – that’s more than 80 pages – whereas 1929 is less than 20 pages. The 1935 list includes ALL nurses registered at that time. Enjoy researching your nurses and midwives!